Normal: usual; not abnormal; regular; natural. Usual or regular. Who decides what regular or usual is to begin with? The definition of these is what determines what is normal. 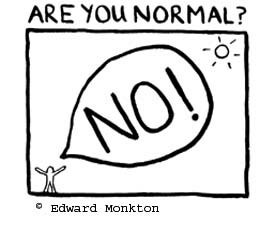 I have heard people refer to someone as , "he's just not normal", what exactly does that mean? Ultimately a criticism of someone else is to say that we are better than they are. They don't measure up to us. I look in the mirror and I see regular. God enters our lives and He sees extraordinary possibility. I have no desire to be normal. Join me.